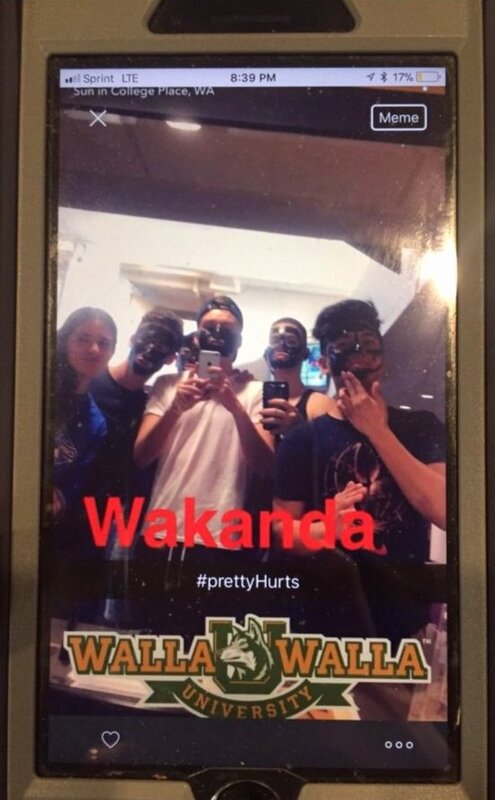 A viral photo depicting Walla Walla University students in blackface with the word “Wakanda” superimposed has drawn sharp criticism and is currently the subject of an administrative investigation on the campus of the Seventh-day Adventist school in College Place, Washington. The photo depicts six students, five of whom have faces colored black with what appears to be facial peel off masks. The hashtag #prettyHurts appears on the image, along with “Wakanda” and the Walla Walla University logo. The “pretty hurts” hashtag may refer to a song by Beyoncé Knowles of the same name about self empowerment and body image. The hashtag has also become a somewhat tongue-in-cheek reference to the pains people subject themselves to in the name of attractiveness. Wakanda is a fictional African country at the center of the recent Marvel blockbuster Black Panther. The film broke ground as the first superhero film with a predominantly black cast. According to Forbes, it is currently the fifth-highest grossing movie ever in North America. The combination of elements in the photo caused immediate outrage when it was shared on Facebook. Perceived as a racist mockery of the Black Panther film and of black people, commenters on social media called for swift action from the university and punishment for the students. Facebook users mobilized to contact Walla Walla University administration, demanding answers. This photo depicting Walla Walla University students in blackface has drawn widespread condemnation. Many black Seventh-day Adventists on Facebook saw the incident as one more reason to support Historically Black Colleges and Universities like Oakwood University in Huntsville, Alabama. Some predicted that Walla Walla would gently reprimand the students but would temper punishment by calling it a mistake and citing the Christian duty to forgive. On March 26, in response to public outcry, Walla Walla University published a statement, “Regarding a recent social media post,” condemning the photo and calling it racist. Just before our spring break, Walla Walla University administrators became aware of an anti-black, racist social media post involving six students on our College Place campus, and we are actively investigating this incident. As soon as we became aware of the post a special task force was formed and met with five of the students involved, and the administration alerted our campus family to the investigation. Our Office of Diversity and Student Life Office are working closely together throughout this process, which is still ongoing. Demeaning others is reprehensible, and this social media post is unacceptable behavior. We at Walla Walla University are thoroughly committed to uncovering the motivations for such behavior and disciplining the involved students accordingly. Walla Walla University has a deep commitment to the values of diversity and inclusion. Our mission statement declares, "...every person is created in the image of God as a being of inestimable value and worth, imbued with powers of intelligence, stewardship, and creativity akin to those of the Creator.” Walla Walla University therefore condemns this behavior and the content of the racist social media post in the strongest possible terms. We prioritize diversity and inclusion, and we want all students to feel welcomed, valued and secure on our campuses. Acknowledging that people, both on and off our campus, have been hurt and angered by this post, our response to this incident will reflect our unwavering commitment to our university’s values and mission. Some viewers saw the picture differently. Many white social media users came to the defense of the students, saying that the “pretty hurts” hashtag showed that they were simply using facial peel treatments, not being racist. Comments in response to a My Columbia Basin article posted to Facebook expressed incredulity that the blackface incident be interpreted as overtly racial. In a public Facebook discussion, white commenters dismissed the idea that the image was inherently racist. Facebook user Jeffrey Alan made a comment trying to demonstrate that the image could have been doctored by someone other than the students in the picture. “First off if you are familiar with Snapchat it shouldn’t say meme in the upper right corner or have the heart in the lower left,” Alan wrote. “Those are indications that is is [sic] in someone’s photo album. The pretty hurts is an original Snapchat style text that seems to go with the charcoal facial peels and yes it does hurt! Wakanda could have been added later after a screenshot was taken of the original. Or it could be part of the original but doesn’t seem to fit the motif,” he suggested. University administration have promised to get to the bottom of the image’s origins in their investigation. But the larger issue of why anyone would find it acceptable to dress in blackface while referencing arguably the biggest black cultural event of the decade remains. For non-white students who have attended Walla Walla, the incident and its clear racist overtones did not come as a surprise. A former Walla Walla University mechanical engineering student who asked to be called Dee H. said that while attending Walla Walla in 2009, students came to a costume event dressed as “aboriginals and a missionary.” She also pointed to 2012 articles in Volume 97, Issue 17 of the Collegian, WWU’s student newspaper, in which opinion editors Elliott Berger and Grant Gustavsen argued against Affirmative Action and claimed diversity was creating a disadvantage for white students. Dee, who studied at WWU between 2009 and 2012, said that while a student there, she was called n***** and was also harassed by local police. “It’s not shocking,” she said of the students’ racist behavior. For Iwata and others the larger problem was the university’s lack of diversity. “Anyone who says WWU is diverse must be only looking at their calendar. It’s not a diverse campus by any means, but I am glad they spend resources trying to make it one,” Iwata said. An audit of Walla Walla’s faculty, administration, and Board of Trustees illustrates Iwata’s point. Of the 20 people listed on the university’s administration page (including administrative assistants), there is one non-white person, Pedrito Maynard-Reid who is a professor in the Theology Department, the university Ombudsman, and Assistant to the President for Diversity. The Board’s 29 members include three non-white members. Of 150 faculty members named on the WWU website, 135 are white (this excludes pre-professional programs). Twelve of the 21 areas of study listed on the website have all white faculties. Only four of the 21 areas of study have more than one non-white faculty members. Taken together, there are a total of 18 non-white persons among those filling 199 roles at Walla Walla University. University leaders form a 91% (admin, faculty & staff) white majority. In the context of the State of Washington’s demographics, data from the US Census Bureau indicates that 80% of the State’s population in 2016 was white (69% non-Hispanic white). Walla Walla University acknowledged its diversity problem in an updated statement, “WWU condemns racism,” posted on the university website March 27. Emails and phone calls to Vice President for University Relations and Advancement Jodi Wagner requesting comment on the ways Walla Walla University is addressing the “imbalance” remained unanswered at the time of this article’s publication. The Office of Diversity, when called for comment, referred me to Wagner's office. Walla Walla also acknowledged the potential fallout the incident may cause. “We recognize that this recent incident has the potential to undo our diligent work to promote diversity and inclusion, and we are determined to not let that happen,” the university said.